Mineshaft Christopher is one of the oldest galleries of the mine Mauritius. Mineshaft Christopher is made accessible for visitors by a 13 m high metal staircase embedded into the pit of the mine Mauritius. The guided tour in the mineshaft is more than 400 metres long (there and back) and comprises a total of 11 stops; the tour takes about 1 hour. During the tour, visitors can see sections that were mined manually using a hammer and a pick and also sections widened by „fire softening“ (fire was set in front of the wall, the heat softened the ore structure and so it was easier to dig into the rock), they will come across a few short turns, excavations and above-head corridors and also meet with figurines of miners dressed in period clothes. 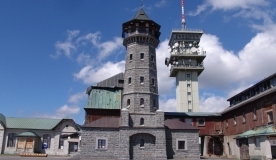 The main attraction of the whole tour is a vast underground chamber at the end of the mineshaft – a chamber 65 metres long, 4 – 9 meters wide and approximately 15 m, but sometimes even 25 metres high, which is a metre more than is the height of the observation tower on Klínovec. An impressive audiovisual projection is also a part of the guided tour of the chamber. In the service house belonging to the mineshaft Christopher you will be lent helmets, flashlights, boots and coats. We recommend that you take warm "outdoor" clothing, including warm socks and boots. The visitors must expect possible fouling of their clothes. A maximum of 12 persons can take part during one tour. A tour of the mineshaft Christopher must be BOOKED in advance. Entry to the mineshaft is forbidden to: children up to 10 years; persons with a phobia of confined space; persons with health problems (motion) and with the problems of maintaining the balance; persons who are drunk or under the influence of other addictive drugs; dogs and other animals.